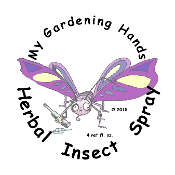 An all natural herbal spray to prevent the attack of Nature's biting bugs. Contains distilled water, grain alcohol, lavender, lemongrass, citronela, rosemary, peppermint, lemon eucalytus, and catnip essential oils. 4 fl oz. As with any product do not use if you have a known allergy to any of the ingredients listed.